A few months ago, Venezuela's Marxist president, Hugo Chavez, faced little opposition and was a near certainty to be returned in the December 3rd election. Now Manuel Rosales is pushing Chavez hard in the polls and has led a series of huge anti-Chavez rallies in several Venezuelan cities. The Latin American and indeed the world wide left realises that this election is a crucial one. If Chavez wins, revolutionary forces will continue to pick off the few remaining non socialist countries in the region. The USA will face revolutionary forces on the Rio grande. If Manuel Rosales wins, the left will suffer a huge moral and material set back. Freedom on the continent will have a chance. With this in mind, Chavez's main allies, the Communist Party of Venezuela, are talking up a Chavez victory and throwing all their resources behind his campaign. The National Directors of the Communist Party of Venezuela, within the framework of the final offensive for December 3, call upon Venezuelan towns, revolutionary forces, and communists to organize and mobilize for the consolidation of the triumph of the candidacy of Commander Hugo Chavez Frias and to dissuade any adventurer that tries to promote imperialism and reaction against the overwhelming popular victory that is approaching in December. The PCV, on the basis of its analysis of the political situation in the country, considers that the conditions for an overwhelming victory of the candidacy of President Chavez exist. 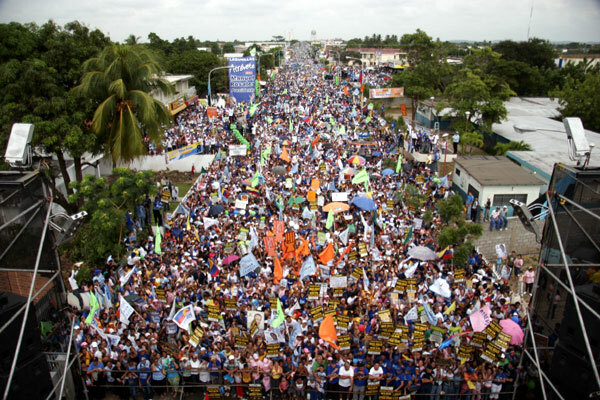 Let's hope, that for the sake of 250 million people that Chavez and the PCV can be stopped in their tracks. It takes about 5 minuets research on the Web to realize that polls about Chavez are usually wrong. I can’t believe the sheep never learn. Ever wonder where all that American cash to get Chavez out actually goes…. you don’t have to be some sort of conspiracy nut to imagine that these polling companies which are usually US based are getting a few coppers. And what about all Trevor's talk of Chavez being a dictator? He's still standing in democratic elections! When I asked you, Trevor, why you called someone who stood in and won elections a dictator you compared Chavez to Hitler, and asked me if Hitler ever won elections. Your comparison has borne out to be as mad as it seemed then. Chavez hasn't cancelled elections. You are wrong. Admit it. What are you on abot anon 2? What are you actually saying I am wrong about? Chavez is a Marxist-Leninist, a tyrant and a thug. So what if he wins the election? That just makes him a democratically elected Marxist-Leninist, tyrant and thug. You compared him to Hitler by saying that Hitler won an election as well. Chavez has now stood in and won several free and democratic elections. Your comparison was ridiculous. Total distortion anon. You stated that Chavez couldn't be a dictator because he was elected. I merely pointed out that Hitler was elected and was also a dictator. My arguement was simply that elected politicians can also be dictators. there are countless examples of this phenomonon, including Chavez. What specifically has Chavez done to cause you to label him a "tyrant and thug"? Try for a start the failed military coup he was jailed for. In my view anyone who tries to take over a nation at the point of a gun is a tyrant and a thug. Perhaps you have a different view anon? The un-elected dictator Musharaf took over in a coup and he is a key ally of the United States in the "War on Terror". It would seem that you are out of step with the USA on this one, Trevor, or a little inconsistent at least. Your friends the Americans have a long and proud history of being allies with "tyrants and thugs". You have no integrity anon. You sidestep basic questions and continually attribute statements or opinions to me that I have never expressed. There is no defence for your thug idol Chavez, so you try and divert the arguement. There were lot's of little weasels like you defending Stalin and Hitler in the '30s, anon. Only because you lack the guts to sign your name, do you escape the odium you deserve. Has there been no violent revolution throughout history that you would have supported? If a North Korean wanting to establish democracy tried to take over North Korea with a gun that would make them a "tyrant and a thug?" "In my view anyone who tries to take over a nation at the point of a gun is a tyrant and a thug." Venezuela was a free country which Chavez wanted to control, to gratify his own power lust. North Korea is a socialist state where people are routinely murdered, tortured and starved by the government. Not too good on subtleties are you anon?